The Big Max Ultra features 467 cubic feet of storage space and includes two skylights and two windows that allow plenty of light in. Its double-walled construction provides extra protection for items stored inside. Our new wall anchor system allows easy installation of shelving, pegboard and other accessories. Size of the shed: 11 ft x 7 ft.
70 cu. ft. Ultra Shed The Jardin Ultra is an extra-large horizontal shed characterized by quality engineering, heavy-duty structure and stylish wood-look design. It is a versatile and multi-purpose storage unit, wide and high enough to store various items without taking up too much space. 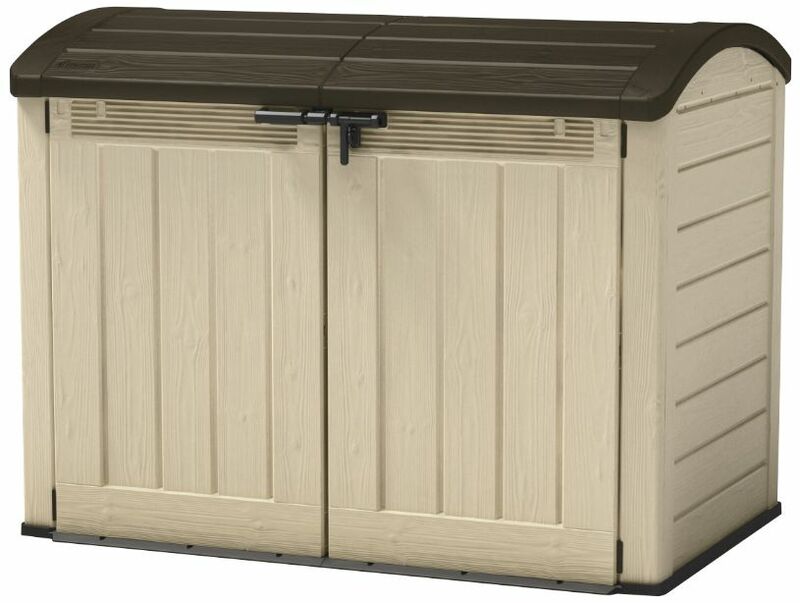 This shed offers a specialized solution for two 360L/96 gal trash cans, and comes with a lid-to-lid chain for hands off opening. 70 cu. ft. Ultra Shed is rated 3.3 out of 5 by 10. Rated 1 out of 5 by Jenn from Not very durable I’ve had this shed for less than a year and the hinge in the lid has broken so it won’t shut properly. Rated 5 out of 5 by Anna from Great product for what we wanted I bought this online since I don't have a vehicle big enough to bring it home. I want to put my outdoor furniture cushions in it.... perfect for this. I am a "handy" gal and put it together by myself. Rated 5 out of 5 by 3LionsRoar from All items intact, no missing pieces Assembly requires two people (at times) and expect it to take approx. 3 hours to put together. I built most of it on a table top to avoid having to bend or kneel. Pieces fit nicely and all pre drilled holes were aligned. It is big enough to store all my patio furniture for the winter (2 love seats and a chair). Happy with final product. Rated 3 out of 5 by Coco from Good looking and perfect size Bought this for store garbage bins outdoor to prevent animals. It was quite difficult to install as some parts were very hard to fit into place. The plastic walls seemed thin and flimsy but it's functional and good looking. Perfect size to fit in two big bins and one small bin. Will see how long it lasts. Would give a five stars if the material were stronger and easier to install. Rated 4 out of 5 by Paul from Impressive design Really impressed with how this was designed to make it easy to assemble. All parts are interchangeable with their brothers so mistakes are near impossible. Clearly thought out design and assembly instructions. Did it myself in less than a hour. Final product is strong and durable. Very pleased with it. Rated 5 out of 5 by TedC from Good size I was looking for a place to store our patio furniture and this was the perfect size and easy to assemble. Rated 5 out of 5 by Mrmo1962 from Great shed This shed was easy to assemble and holds 4 70 litre garbage cans. It is secure and keeps the contents dry. It has very clean lines and is everything that I hoped it would be. Rated 2 out of 5 by EGEG from Nice Roof, Lots of Space, Fragile Good form-factor and storage space when purchased at a discount, but the unit is structurally questionable. While the roof can handle heavy snow loads, this unit can only handle vertical stresses, as the side panels and doors are just too thin to use as anything other than trash storage. If you rest a large number of items against the walls (ex. rakes, shovels), they'll bulge out. If you put heavy objects in the unit, the floor may crack. The doors are easy to pull open even if locked. Hinges are easily bent in high winds. The wind can force the doors into the unit without something heavy on the roof or it tightly tied shut. If no lock is in the hasp, the shed can be blown open, fully. With a lock, the shed will open a few inches with each gust. The doors rattle and admit some rain/snow even when locked. The area around the hinge mount is prone to cracking in the cold. Customer service direct from Jardin/Keter requires photographic proof and a receipt just to order a replacement hinge. Understandable if it's under warranty, but for such a cheap part, immediately demanding proof of ownership without explanation wastes my time and isn't something I've encounter from other companies. Can the Jardin 70 cu. ft. Ultra shed hold adult bikes? If so, how many? Hello Jackie27, Here are the internal dimensions: 65.0&quot; W x 38.0&quot; D x 50.0&quot; H. We recommend comparing these dimensions to those of the bikes to be sure. Does this storage unit lock or have the ability to lock? Hello Lisa814, Yes the deck box come with a latch where a pad lock can be placed. lock is not included.